Yes, it is about Derby time again. For the new readers, that is the Derby 50k, a sweet low key road run in the middle of nowhere put on by Mark Long and the Mangum Track Club. this will be my 12th year in a row in what has become my annual Thanksgiving weekend tradtion. 2014 about 10 mile mark. It was a bit cold. I have had some good runs there over the years including a few pr's. I've also had a couple of bad years and I have run with friends in the past in their 1st ultras. 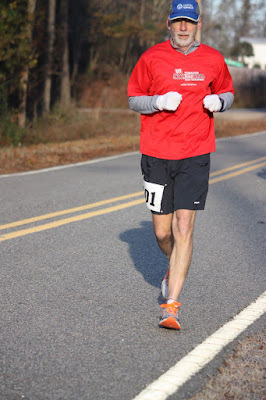 It had been a long time since I ran a fast one there, mainly because over the past several years I have either been coming off of an injury or I am a bit worn down from running OBX marathon which I have done 7 years. LAst year I was both coming off an injury, running OBX and then a fast 5 k the week before. No surprise after a fast first 10 miles I slowed down quite a bit ! This year I was hoping to go for a pr since I didn't go to OBX but there was the old injury bug keeping me out for 3 months. At least I am healthy now and the training is going great but I have not had time to build up with the long runs. So far I have only done a few 13 and 14 mile runs and then last weekend my longest so far of 16. I wish I could have gotten in a few 20 milers but now I will just have to do the best I can. Who knows? I still may have a long shot at the pr but everything will have to go perfectly and then a miracle on top of that. At least the weather forecast is looking great. I'll just run how I feel and see if I can keep from blowing up . So, I did have another awesome week of training last week. I started off Monday with an easy 4 at home . Wednesday another run from home on a foggy morning with some strides for a little zip. Thursday was an unseasonably warm morning with rain. I needed to get an early start so I drove to the neuse at trailhead. Just as I was walking to the start , Laura drove up. That was a nice surprise so we ran the first 2.5 miles together. As aways a bit quicker than my normal with a 7:38 second mile that felt easy. As she continued on I turned and headed back still averaging at my current BQ pace ! And then it was time for Fun Friday ! 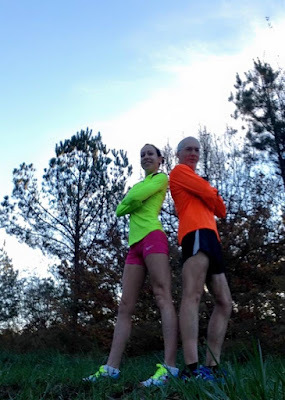 It was a beautiful morning and we planned on some half mile repeats, aiming for about 7:15 pace. Well, I was having a great day and the slowest of 5 was at 7:12 and a couple were around 6:54 pace. We did a recovery mile and then pushed the finishing segment and I got a pr for that and the time for the whole 6 mile route was anothe pr by 15 seconds. I still have never had a bad workout with her and she continues to bring out the best in me and make me smile while iI feel like I'm about to die. Saturday was a recovery day with an easy 5. Sunday was back to the neuse at the dam for a 10 miler. I didn;t want to go longer with the race coming up so I thought if I felt good I would do a little faster pace. I felt really good so after 5 I did a tun and burn with the last 5 at a bit faster than marathon pr pace. Ended up with another 43 mile week. So stay tuned. I hope to have a race report up for you soon. "Until then Happy Thanksgiving !